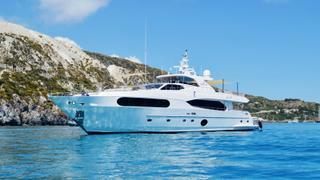 The 32 metre motor yacht Mykonos has been listed for sale by Burgess. Built in GRP by UAE yard Gulf Craft to an in-house design, Mykonos was delivered in 2015 as hull number eight in the Majesty 105 series. A popular charter yacht, she accommodates 10 guests in five cabins configured as a full beam master suite with two doubles and two twins below deck. All guest cabins have entertainment centres, television screens and en suite bathroom facilities while there are quarters for five crew in three cabins aboard this yacht for sale. A generous beam of 7.1 metres allows for a magnificent saloon with comfortable seating, a bar and an entertainment centre including a 55-inch Samsung television screen and a Bose Lifestyle surround sound stereo system. Forward is a formal dining area with seating for 10 guests. Outdoor areas are especially good and include an aft cockpit with a table and chairs beneath an awning along with access down to the hydraulic swim platform. The vast flybridge is hugely popular, offering a second helm station, lounging areas on soft settees, a wet bar, ice maker, fridge and Teppanyaki barbecue grill, all protected by a custom hard top. For sunbathing in privacy, the foredeck has a built in seating area with sun pads. Twin 1,920hp Caterpillar C32 diesel engines allow a cruising speed of 12 knots topping out at 26 knots and she is fitted with zero speed stabilisers.